How do you know which keywords to use in the SEO of your website? One of the tools that you can use for free is the Google Keyword Planner, which measures how many times people actually search for keywords. The Google AdWords Keyword Planner is normally used for paid search results (Google Ads), but the Keyword Planner can also be used for organic searches because BOTH paid and normal results appear in Google search results. 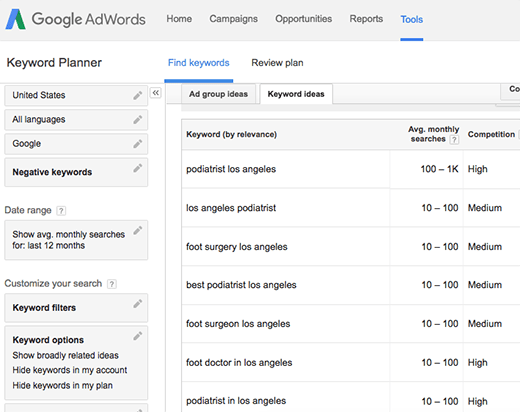 The results of the Keyword Planner are then checked against the number of competing web sites. The best keywords have high numbers of searches and low numbers of competing websites for those same keywords. After a keyword list is finalized by the you (the client), the keywords are then placed by me in specific areas of your website where Google and other search engines (Yahoo!, Bing) look for keywords to index in their search results. Also crucial to SEO is link building, which involves linking your site to social media sites and other high traffic sites that will help your traffic and Google rankings. I provide link building services and/or guidance on how to do-it-yourself. To learn more about SEO, download this free guide. Did you know that you can SEO your social media profiles? This is a great trick! You’re basically using the traffic on popular social media sites to get yourself on the first page of Google. If you do a search “SEO Web Writer” my Twitter page comes up on the first page of Google search results. If you do a Google search for “SEO Copywriter Los Angeles” my LinkedIn page comes up on the first page of Google results. I’m using those very popular social media sites to leap frog in search results, and so can you!